Many older Pastorela Diablo masks from other areas of Michoacán are larger than those we have examined thus far. Furthermore, the Pastorela Diablos from Guanajuato are also generally larger, more or less on the same scale. Some of these larger Diablo masks are characterized by prominent intertwined snakes that are wrapped around the entire face of the mask. Over the next few weeks I will show a number of these larger masks from Michoacán and Guanajuato, at least three each week. The first mask was collected in San Nicolás Obispo, a town in the Municipio of Morelia. Morelia, the county seat of that municipio, is a Spanish colonial city in northern Michoacán. All three of today’s masks come from this northern area, where there are few Tarascan Indians and the inhabitants are mostly Mestizos. The Pastorela performance was introduced by missionaries from Spain, supported by Spanish settlers, and adopted by the Tarascan Indians. It is paradoxical that such Spanish traditions are sometimes maintained most strongly by Mexican Indians, while the Pastorela has remained popular in Michoacán’s Mestizo communities as well. Unfortunately I have not found video recordings of the Pastorela in these northern towns. I purchased this mask from the Cavin-Morris Gallery (in Manhattan) in 1995. I feel certain that it was carved in the mid-20th century, and probably collected in the field circa 1970. A pair of rather large snakes loop around the face. Vision openings for the dancer are tucked unobtrusively between the oversized carved and painted eyes. One of the snakes does double duty as the devil’s nose. The tongue on this mask is a separate wooden element that is nailed to the lower jaw. Today we will look at some additional masks from La Cañada, a fertile valley in the mountains of northern Michoacán. This valley contains a string of eleven towns— the “Once Pueblos.” According to Robert C. West, in Cultural Geography of the Modern Tarascan Area (1948, pages 18-22, 25), La Cañada is one of several “resistant cores” in Michoacán where the Tarascan Indians have maintained a dense presence and continue to speak their traditional language. Chilcota, the town where the masks in last week’s post were collected, is the county seat of this Municipio, also named Chilcota, and today’s masks will certainly remind you of the pair that I featured last week. We will see masks from three neighboring towns in today’s post—Tanaquillo (or Tonoquillo, per West), Ichán, and Santo Tomás, all originally collected in these towns by Jaled Myaes and Estela Ogazon. I purchased them from Robin and Barbara Cleaver in 1988. To get you in the proper mood to appreciate these masks, here is another Pastorela video, this one from Ichán, where one of today’s masks was collected in about 1987. We may be seeing the same Diablos that were featured in last week’s video. It begins with a child Angel (an Angelito) delivering a stern lecture to Luzbel (Lucifer, aka Satan), to the effect that God will defeat all evil. Luzbel replies ferociously that he intends to rule the world. We see how vividly children in México are drawn into their (Roman Catholic/Tarascan Indian) experience of Christianity! In passing, you may not be aware that in the Roman Catholic tradition Angels are considered to be without gender, so all of these child angels are referred to as Angelitos, whether portrayed by boys or girls. These Angelitos (and Archangels, such as San Miguel) pass a portable microphone from one speaker to the next, so you can determine who is talking by looking for the microphone. 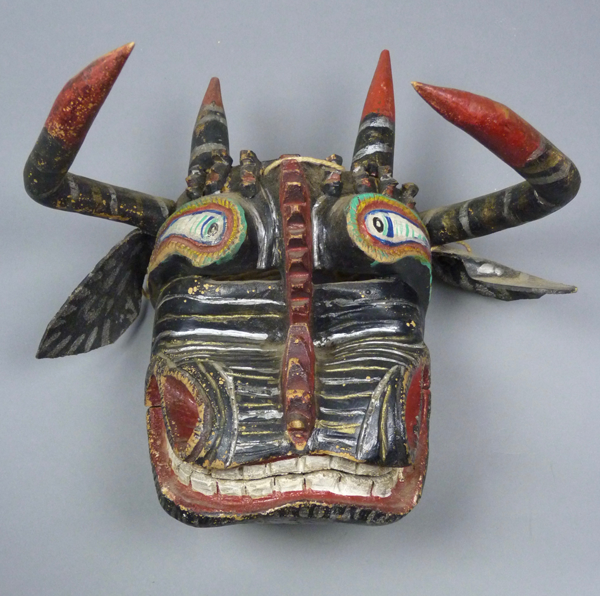 And here is a Diablo mask collected in Ichán. It is at least 30 years old and probably more, but we see similar masks in contemporary use in the video. In Michoacán and Guanajuato, masked devils commonly appear as major characters in the Pastorela performance. Here is a brief synopsis of the Shepherds’ Play, La Pastorela. An Angel appears to Shepherds in their fields, telling them of the birth of Christ in a stable in Bethlehem. The Angel urges the Shepherds to go and pay homage, which they agree to do. The Shepherds enlist a holy but wisecracking hermit, el Hermitaño, to accompany them. As they travel, the Shepherds are approached by a band of Diablos—who are named for and promote “the seven deadly sins,” such as lust, gluttony, … The Diablos attempt to dissuade the Shepherds from continuing their quest, offering them the riches of the world if they will only turn back. Some of the Shepherds, such as Bartolo, are susceptible to such offers and waver in their resolve. The Hermit must exhort them to continue, and there may also be further visits by angels to clear the path of the obstructing Devils. The play ends with the sequence familiar to many North American Christians, as the Hermit and the Shepherds file down the aisle of a church and approach the creche containing the infant Jesus. Here is a video from Carapan, Michoacán featuring a magnificent corps of Pastorela devils, first just one and they build up to six. You will observe that, because the Pastorela is a European import, the “dance” or play comes down to an exchange of orations between the devils, the archangel Michael, and other players. As you will see, there is great variation in the Diablo masks found within Michoacán. Today I will focus on the masks of one unusual and distinctive carver from Chilcota, Michoacán. His masks are highly distinctive, yet they also reflect the style of this region—La Cañada—which also includes the town of Carapan. In Lo Efímero y Eterno del Arte Popular Mexicano/ The Ephemeral and Eternal in Mexican Popular Art, published in México City in 1971 as a two volume set in either Spanish or English, Volume 2 is devoted to photos of masks and dances. On page 466 of Volume 2 there are photos of two rare and unusual Pastorela Diablo masks from Michoacán, plates 396 and 397. Plate 396 reveals a canine faced diablo with huge wooden fangs, an oversized extended tongue, and a miniature devil crouching on the bridge of the nose. A footnote only tells us that this mask was from the “Danza de los Diablos (? )” in the Mexican state of Michoacán. I have never seen one like this, except in this photo, but it is certainly from the Pastorela dance. Plate 397 shows a devil with a bull’s face, with seven tiny devils’ heads in a line across the forehead. 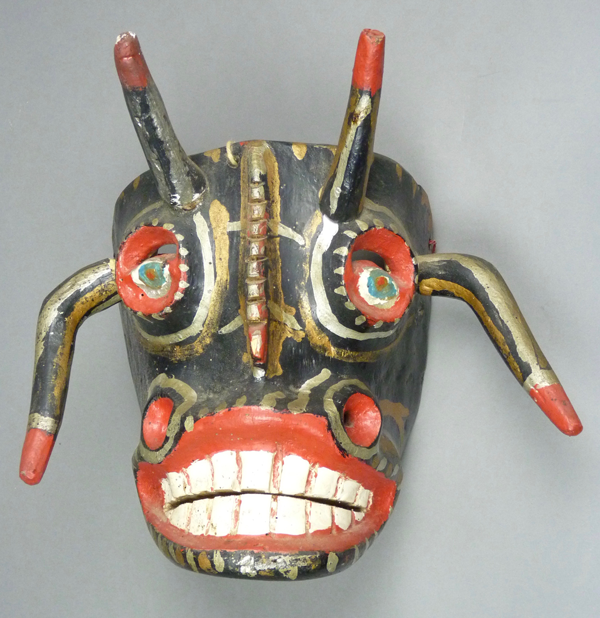 This mask was photographed in the collection of the Museo Regional de Artes Populares de Pátzcuaro, Michoacán, but the note says nothing further about its provenience. I have two masks of this style in my collection and I have seen another that is identical to one of mine. Today’s post will feature my two examples. I purchased both of them in June, 1988. These masks were found in Chilcota, Michoacán, 1n 1987. I do not know the carver’s name. The first one has an ambiguous face. Is this a dog or a bull? Perhaps this ambiguity is purposeful, to create a frightening and evil appearance? I bought ths mask directly from Robin and Barbara Cleaver. Following the conquest of Mexico by Cortez and his conquistadors, Roman Catholic missionaries arrived with the charge to convert the Indians to Christianity. Because these Indians had traditionally used masks, costumes, music, and dramatic performances to portray their gods and beliefs, it seemed obvious that such theatrical practices could be used to teach them about European religion, so plays that had long served to convey and reinforce Christian teachings in Spain and other European nations were adapted by the missionaries for use in New Spain. Of these, the most famous are La Pastorela (the Shepherd’s Play) and Los Moros y Cristianos (the drama of the Moors and Christians). I have told quite a it about the latter play in earlier posts, particularly noting how this became the model for other dance dramas, such as the Santiagueros. Today I will introduce a series of posts about the Shepherd’s Play. In my post of Aug 11, 2014, I had shared with you some images of a Diablo mask that was used to portray Satan in a Michoacán performance of the Shepherd’s play. My purpose then was to illustrate a remarkable fact—Mexican Masks, Donald Cordry ‘s famous book, contains a curious mixture of inauthentic (decorative) masks and extremely important authentic masks and related dance photos. Today we will revisit that terrific Diablo mask, which is one of my favorites, and compare it to dance images provided in Cordry’s book to introduce the Pastorela dance. Here is this Diablo that I first showed you nearly three years ago. 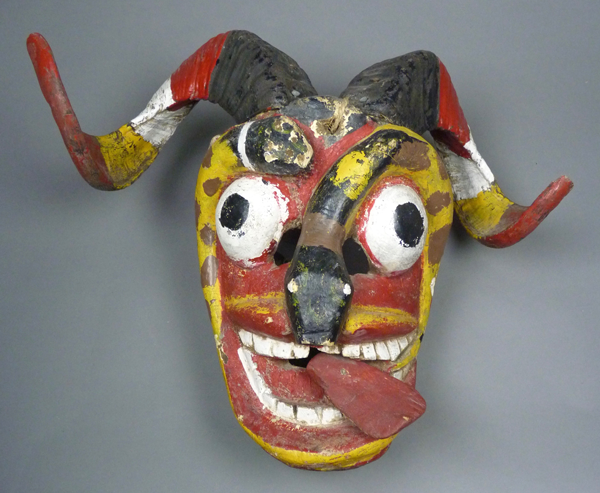 Spencer Throckmorton, an ethnographic arts dealer in Manhattan, is particularly fond of devil masks, and he once devoted an entire wall of his apartment to their display. In 1995 he sold those masks, and I purchased this beautiful old Diablo from his wall. It was originally collected near Lake Patzquaro, in Michoacán. It had four holes around the forehead, the central pair were each 3/8” in diameter; I wondered about the purpose of those holes. Paging through Cordry’s book, I found photos (Plate 7 on page 6 and plate 307 on page 247), which included a mask that resembled and explained my mask, and it even appeared to be by the same hand. Those photos were taken by Donald Cordry in Cherán, Michoacán, in 1935. The mask in the photos had curved wooden horns projecting from holes on the sides, along with carved snakes writhing across the forehead. Identifying Pascola Masks—Old or Contemporary? As you may have gathered, Dr. Stevens and I have had many dialogues about masks, carvers, and Indian culture over the past 25 years, in person and via email, and these have been enlightening and enjoyable for both of us. I have read with interest his blog about Mexican Dance Masks over the last three years. His posts during this past year on Pascola masks have been my favorites, for many reasons. Dr. Stevens is methodical in his identification process and he brings years of experience to the task of identifying and speaking about Yaqui and Mayo Pascola masks, after viewing and handing hundreds of them in public and private collections, including my own. Dr. Steven’s blog provides a wealth of information that encompasses years of thought, travel, observations and scholarly research. He has a pleasant way of presenting his readers with almost “matter of fact” information that has taken decades to be able to discern. I met Dr. Stevens while working as a curator at the Arizona State Museum. It was a week or so before Easter and I learned from my colleagues that Dr. Stevens was “right on time” for his annual visit to the ASM collections division to view the Pascola masks yet again! My kind of guy. 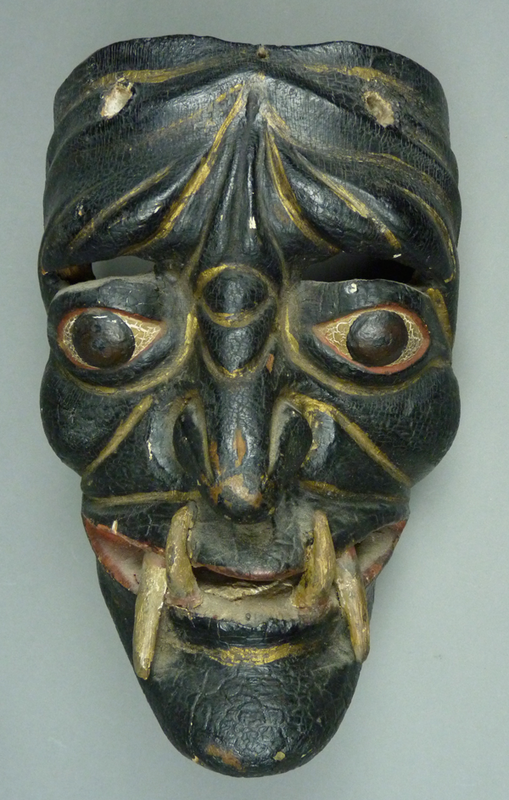 My interest in Pascola masks focuses primarily on contemporary masks and carvers (the last 30 years or so). I particularly like masks made by carvers I have met, repeatedly interviewed, and photographed during the process of the carving. I enjoy observing a mask in the making and then seeing it worn at ceremonies. It intrigues me seeing how a mask changes in appearance over the course of further use. 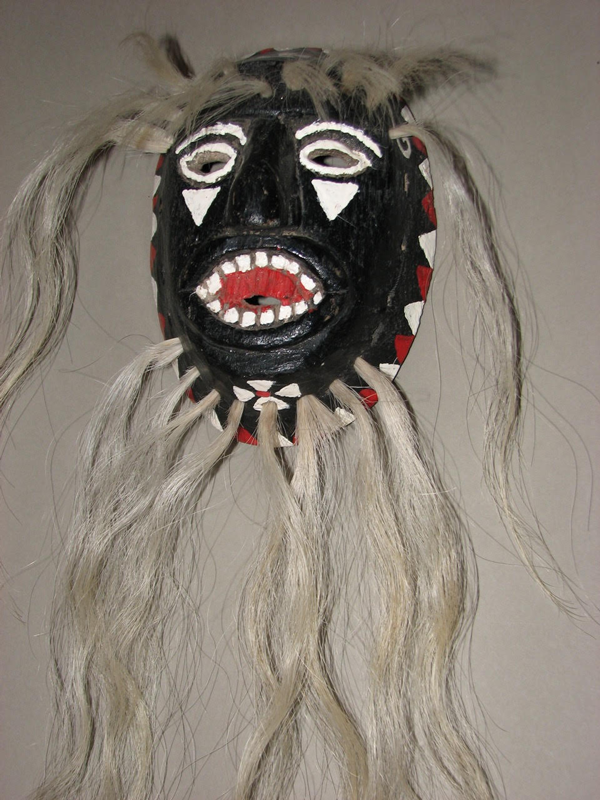 Masks are initially made by a carver, and are then very often made over or remade by the dancers who use them, so that these masks reflect the dancers’ design preferences and paint colors rather than those of the carver. Lastly, I am interested in the relationships that Pascolas have with their masks, do they have one or more masks that they use on a regular basis, do they loan their masks out to other Pascolas, and how often do they clean and touch up their masks? Such topics will be the subject of this post. I will tell about a single Yaqui mask (like those you have read about in the past year on this blog) and then a single Mayo Pascola mask. An Old/New Yaqui Pascola mask. This mask is an old (1950s) Yaqui Pascola mask that was brought to a Yaqui carver to be refurbished. The owner, a Pascola dancer who had used the mask for decades, sought help because the hair was falling out, the paint had faded, the face was dinged up, and it was showing it’s age. The carver, a friend of mine who was certainly not the original maker, told the Pascola that he would be happy to refurbish the mask and to come back in a few days. The Pascola dancer returned to pick up his mask; while visiting he noticed some masks that this carver had recently made. One in particular caught his eye and he told the carver he would like to buy the mask but he didn’t have money to purchase it. The carver, knowing that I was researching masks of various ages and that I would probably buy the old mask (now refurbished), told the Pascola he would trade him the mask he wanted for his old mask. The Pascola was thrilled to make the trade and get such a fine new mask.